I have been making willow baskets in Onekaka, Golden Bay for more than 30 years. The ancient craft of basketry has long intrigued me. With natural materials and few tools I can produce beautiful, functional items. In an ever complex world it is very grounding to get back to basics and hand make a product that is both eco friendly and useful. My baskets come in many shapes, sizes and colour combinations and no two are identical, they are one off creations. The baskets on this website are baskets I have made over the years and mostly I can replicate items if requested. I’m also happy to make to order if you have a specific request. Friends and neighbours gather for a day of harvesting, feasting and fun. The English osier or basket willow that I grow on our property at Onekaka, Golden Bay is the same basket willow that has been grown in Europe and the UK for centuries. We cut the willows in the winter, an occasion when friends and neighbours gather for a day of harvesting and feasting. 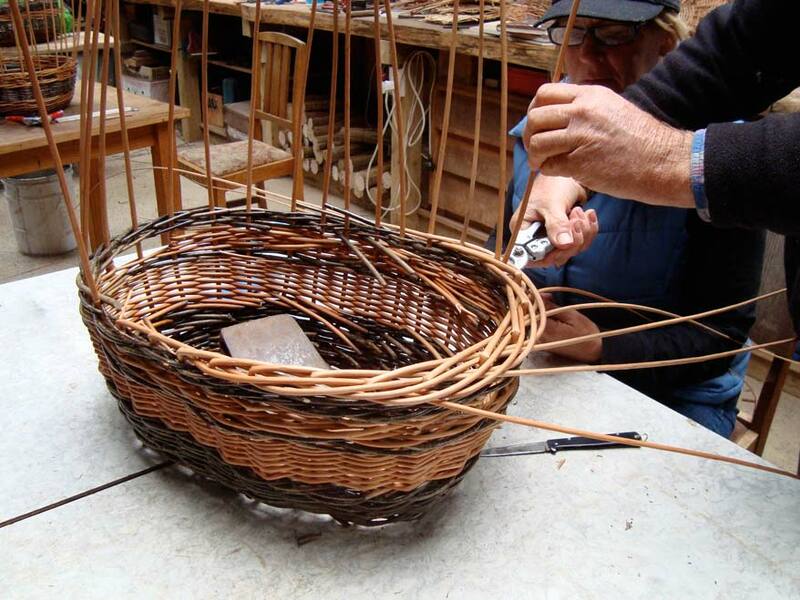 Over a two day workshop, you will make one or two simple baskets, and in doing this come to grips with basic willow basketry techniques. You will create something natural & beautiful, enduring & strong, and feel the satisfaction of making it yourself. The basic willow weaving techniques learned can later be used to make baskets out of a variety of other materials. With natural materials and just a few simple tools, we can produce beautiful, functional baskets. In an ever complex world it is very grounding to get back to basics and make by hand a product that is useful and regenerative for us and the ecosystem we live within. This weekend will be suitable for both beginners and for those who want to consolidate skills already learned. We will make a couple of simple baskets, learn basic techniques and explore the mysteries of the willow industry. There is also the option of rebelling and getting a bit wacky.